I need more of your recipes! Thank you so much for taking the time to put this all together and post it. Came at the PERFECT.TIME! Thank you for re linking your spaghetti sauce recipe on here. Holy SMOKES it is 1,000 times better than I even imagined it would be. I had to stop myself from just consuming it by its lonesome. Funnily enough as I was simultaneously preparing this sauce I was making the crockpot salsa chicken…so simple, so delicious. Thanks! Oh and I also make your simple quiche at least every other week. You’re a clever, thrifty lady. Thanks for that! is this app from wal mart ?? Definitely download the Walmart Savings catcher app! It compares prices to all other big grocery stores and gives you the best price. When you want to use it you convert it to an e-card and that amt is deducted off your purchase. I’ve gotten back $407 over the last few years! Grocery shopping looks like pulling up to Harris Teeter and pushing the call button, then waiting while they load my groceries in the car:) I paid $75 for the year subscription to this service and it has been worth every penny. I order my groceries online the night before and cannot say I miss shopping with my kids at all. Not a bit. I also like being able to watch my total as I fill the cart online. That helps me track my spending and not going in the store means I bypass impulse buys. when is that service coming to my big box store ? it is nice to order items online that are taking up too much space in our vehicle but there are too few items available for online shopping and we still have to do instore shopping. 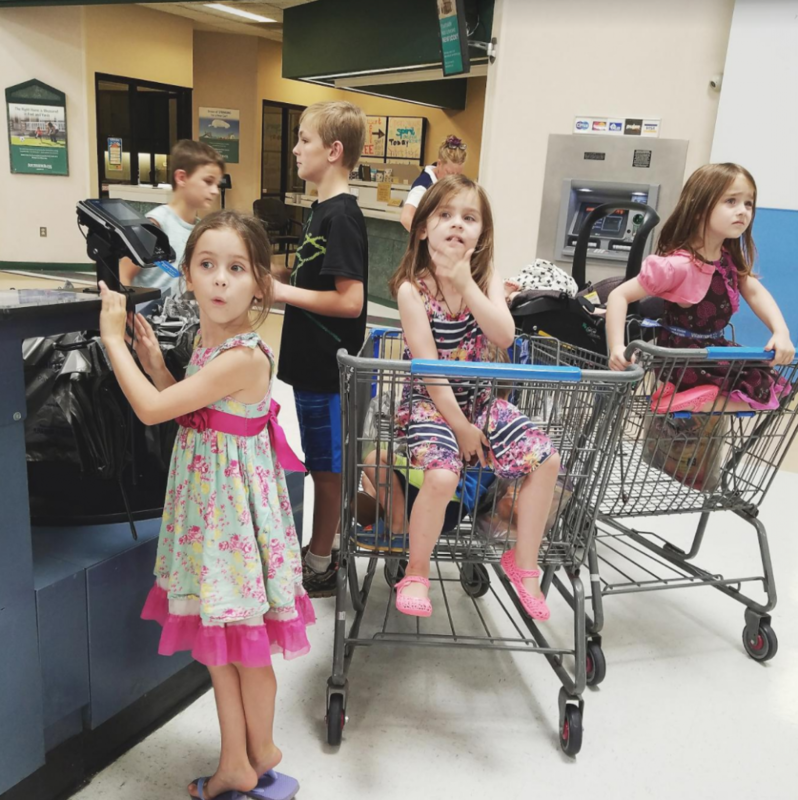 wow I am so encouraged that you did not add significant time to what surely is already a time consuming errand by spending hours couponing..Having your children with you is such a significant lesson for them on so many levels and must be a great homeschooling lesson as well. Great preparation for their adult lives. I have wondered how your weather has been with all the hurricane news. I realize it is a huge state and area but so has the weather been. We haven’t been affected at all. Replying to myself *facepalm* . . . Your instagram seems to have gone awol. Is that deliberate? Your pictures always make me smile! Do you just mean that the widget isn’t on my blog’s sidebar anymore? I’m still on IG, for sure, but I put periods between my username (m.is.for.mama) because people that found me there instead of coming from my blog couldn’t figure out who “mis for mama” was. (*facepalm indeed*). I didn’t realize it had affected my widget until just now. I’ll have to fix that. Do you ever eat vegetarian meals? As a vegetarian it really stood out to me that all of the meals you listed contain meat! (I don’t mean that to sound judgemental at all, I’m just curious). We do every now and then. My husband really likes some kind of protein with his meals (as do I, honestly…my body needs it with the amount of exercise I do) but is not a fan of tofu or the like. I realize there are plenty more options for protein replacements than that (we eat lots of eggs), but the long and the short of it is that we like meat around here. Ha! I love seeing other families’ favorite dinners! I have 8 nearly 9 kids and on good weeks we spend less than 150 and on stock up weeks just over 200. I have 1 young adult and 3 teens, besides the smaller kids. I haven’t had to shop with all my kids for years but usually bring one of them with me for assistance. Or I sent my oldest kids alone with a list. That’s the best! My husband and I have a date every Saturday and usually eat out, with take out pizza maybe twice a month for the kids. I don’t buy much prepared food except crackers and cereal. I nearly always cook ( but weekly we end up with a breakfast for dinner night) and I’ve worked really hard to teach my older kids how to cook for our family and they take turns. And since baby 9 is due in a week so they will be on duty! Sending my kids alone with a list sounds awesome! I’m thinking they would actually LOVE that (well, I’m sure it would get old if they had something else they would rather do, but I can see my oldest three getting a big kick out of doing the grocery shopping when they’re teenagers). And good for you on your amazing grocery budget. You are killing it! Great post! I especially loved the list of your go-to’s. I have never heard of King Ranch Chicken so I googled for a recipe of it, I can’t wait to try it! My family will love it. Yes! It’s so yummy! I don’t usually eat it when I make it except a taste or two, but it’s SUCH a great way to use up all of the crumbles in the bottom of the chip bag(s). We always have several round of leftovers from all of the corn chips we consume. Shopping in our family looks similar to your pictures. It’s so nice now that the older kids can help in our family, too! We usually shop on Thursdays during the day and make it a math lesson while avoiding lines at the check-out. We are all about HEB and their meal deals, though. Walmart usually gets us in trouble; too many non-food options and in our area produce is significantly better at HEB. Every week there’s a new Meal Deal that that includes 3-5 free items when you buy one. My favorites are the fajita and spaghetti deals. You get the entire meal for the price of the one item, which is usually the protein. There’s also small yellow coupons next to 100+ items that are 1-2 dollars off or a “buy this, get this” type thing. sometimes the meal deals aren’t worth it for us or we didn’t eat those items, and sometimes I double up. It’s like coupon without having to cut anything out or remember them. 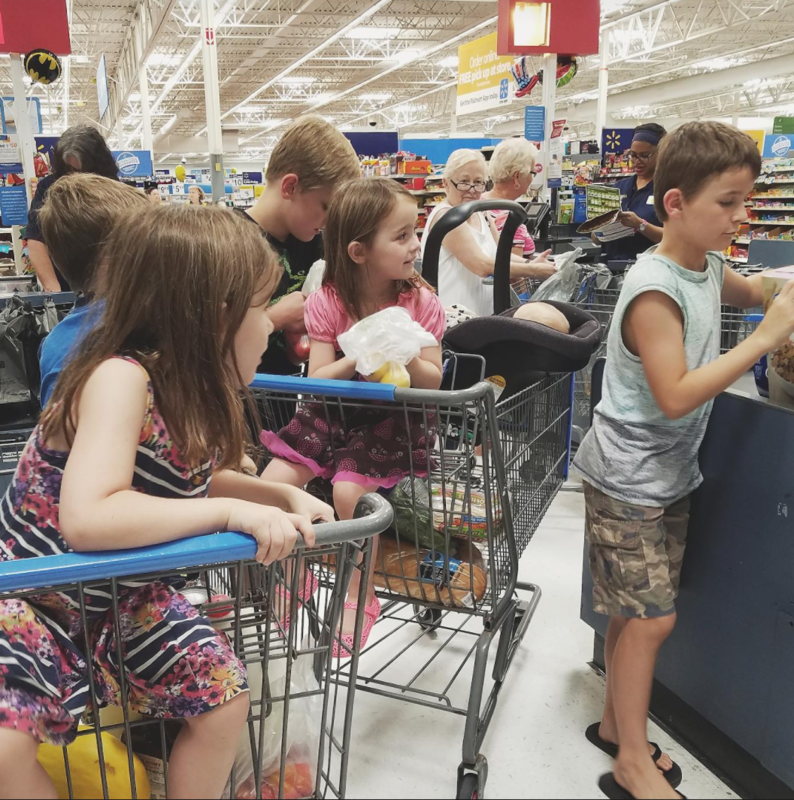 I love seeing all your littles helping you out shopping! I’ve been worried about how to manage going to the grocery store with my son (7) and our new born little lady, but you give me hope and determination! Oh, and have you heard of ibotta? I’ve tried couponing and price matching too, but I really like using the ibotta app the best. You’ll do great! Kids love having responsibilities. Just make him in charge some specific aspect of the trip, and he’ll be so proud of himself and GENUINELY helpful. I don’t shop Walmart often but was going to mention that. It’s just the Walmart app and it’s called Savings Catcher. I’m pretty sure if you just sign in or whatever it can add your receipts and you simply “submit” it and in a few days it tells you what you get back based on sales at other stores. Then it will give you an e-gift card to use when you shop. Easy enough that I bet you could add it to your routine and it would just be a small bonus if you shop there regularly. I spend about $200/week for the 7 of us (really only 6 because hubby’s mostly on the road). 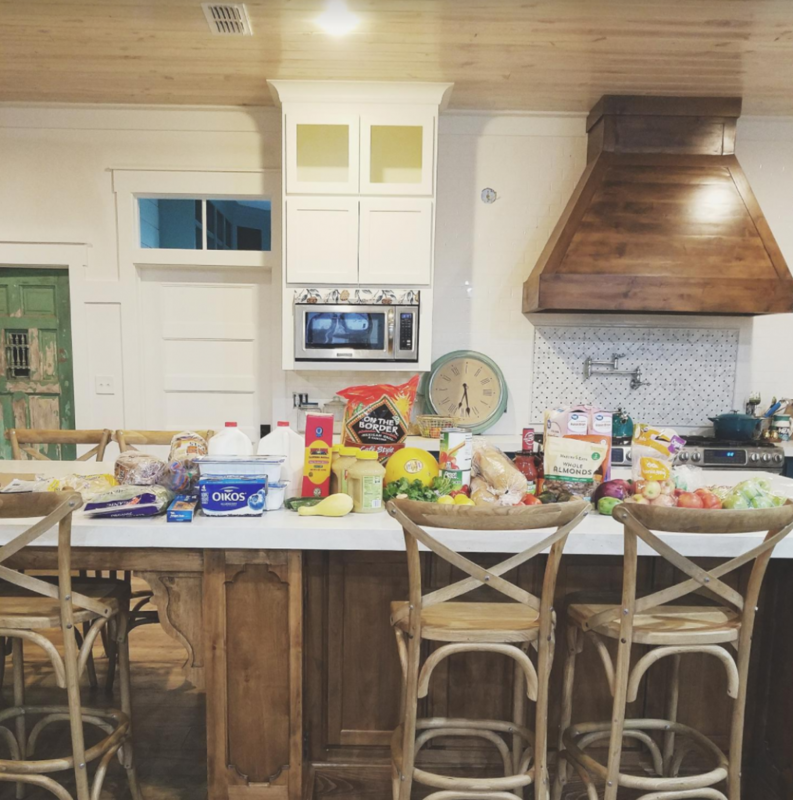 That’s feeding 3 teenagers – my 14 year old football player eats a TON right now! I’m buying more protein bars, granola bars and instant breakfasts than I like, but it’s cheaper than eating fast food on the road. I’m a pretty decent cook, but it cracks me up that hubby’s most requested recipe is a ham & cheese quiche that is SO easy to put together! It costs $8-10 maybe, but feeds us all for dinner and most of us again for lunch. When the kids were really small, we had to call it ‘family omelette’ because they ‘didn’t like quiche’! That’s hilarious about having to rename the quiche. Have you ever made granola bars? Just curious. I have a time or two, and they were pretty yummy/easy/fast and definitely cheaper than the store bought kind. I spend more than you do on groceries each week but we are gluten-free and mostly dairy-free so I assume that is why. We rarely buy anything processed which I guess saves some but overall it still ends up as spending quite a bit as a family of 6.